The Nutri Ninja (BL450) is one of the best ninja blenders available in the market today. It is a small yet powerful blender, which is can be used for extracting juices from both fruits and vegetables. It ensures that it produces beverages with the taste of nature. The only difference is that this is a byproduct of the other. During extraction, this blender works towards ensuring that all nutrients are preserved and none is lost through oxidation. 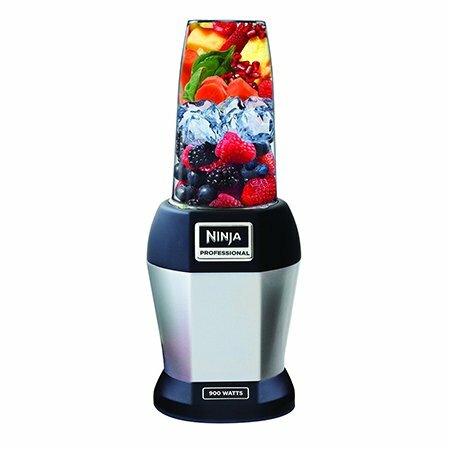 The Nutri ninja pro blender blades are so powerful that they cut through the seeds, ice and skins of the fruits and vegetables and the end product is a very smooth beverage that is suitable for human consumption. Even you can read our nutri ninja vs nutribullet comparison. The following are the features of this type of blender. It has a one year warranty from the manufacturer. The user is able to enjoy the one year guarantee in case of a breakdown. Despite its small size, the machine is capable of using 900 watts of professional power. This is proof that it is a very powerful gadget. The machine enjoys high operation speeds since it is made to use pulse technology. This blender has a powerful nutrient and vitamin extraction which enables it to unlock all the benefits that are natural in the fruits and vegetables. It has very sharp and strong Ninja blades which cut through seeds, skin, stems and even ice so as to produce a beverage that has a very smooth consistency. This machine is suitable for frozen blending. It has the capability of blending with ice and fruit and vegetables that are frozen fruits so that one is able to end up with cold smoothies and drinks that are healthy. It contains cups with their seals and leads which are 12oz, 18oz and 24oz for various juicing needs according to sizes. This type of blender is dishwasher safe making it easy to maintain the hygienic levels after every use. It comes with a wellness guide that contains 30 recipes. It is very fast in its operation of extracting juice from the vegetables and juices. One is assured of the shortest extraction time before they are able to enjoy their favorite beverage from the fruits and beverages. It has single serving containers which can easily be used to enjoy the juices. These serving containers are multi-purpose and can be used as blending jars. With an operation power of 900 watts, the blender can perform the duty of extracting large amounts of juices without breaking down after sometime. The machine is able to work for longer hours. Apart from its speed of operation it is stylish for those who are conscious about the machine they are using in the kitchen. It is also small in size. This blender is easy to operate to all classes of people regardless of one’s education level. It is available in all the major retail stores in the United States of America and in Canada. In order to achieve that smooth smoothie drink or any other beverage, one needs to have the knowledge of how to use the Nutri Ninja (BL 450) type of blender. It is one machine that is quite easy to operate. First of all you are required to place the desired fruits and vegetables in the blending cup or jug. They should be chopped into small pieces so as to have a small surface area that will be able to fit into the jug. Add a little water which will help in the extraction process. Turn it in order to lock it into the base which contains the motor of the blender. Then cover it using the bladed leads. When one presses the jug, it automatically switches on the power and the blades are rotated at a speed of 21, 000 rpm. This is able to chop the fruits and vegetables into very fine pieces and at the same time extract the juices from them. The end product is very fine and does not have any particles of the raw materials. The beverage may be a smoothie or just juice depending on the ingredients. Once the desired consistency is achieved, turn the jug onto the opposite direction to unlock it. Unscrew the blades and remove the jug that now has your smoothie. The end result is served either at room temperature or cold with ice. It can also be let to chill for a few minutes before it is served. Enjoy your beverage. It is important to note that the cup can be used to sip the juice or it can be transformed into a go container. This product is best for individuals who are health conscious and would prefer to take natural juices instead of the juices from the supermarket which are loaded with a lot of sugar. It is also best for individuals who wish to take juices as a form of treatment. This is done with the advice of the health practitioner who is an expert in these matters. This mostly happens to individuals who would prefer alternative treatment to conventional treatment. Ideal for businesspersons who deal with making a lot of juice for sale. It is a preferred choice since it has the capability of handling large quantities. It can work for long without being overheated or breaking down. Nutri ninja pro blender competes with the big and large blenders when performing its basic function. It is a powerful single serve blender that does not cost a fortune. It has the power to do more but its set up does not allow it to multitask. This is a best Ninja blender that is of multipurpose because it can be used a juice extractor and as a blender at the same time. It is highly recommended because of the high speed of operation to achieve smooth beverages within a short time. It is also proper to use Nutri ninja pro blender because it does not break down quite easily.